VIDAR Systems Corporation - the recognized leader in film digitizing technology - offers the VIDAR DiagnosticPRO® Edge Film Digitizer. At double the scanning speed it allows for more studies in half the time. VIDAR's DiagnosticPRO® Edge film digitizer takes the highest reliability, image quality and consistency of any digitizer on the market to the next level of performance. 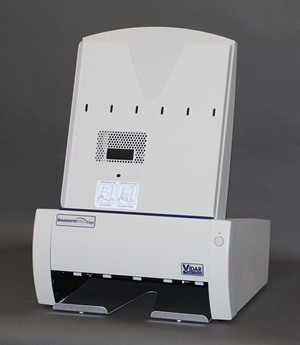 At double the scanning speed it allows for more studies in half the time. With its DUAL USE function, DiagnosticPRO Edge offers all-in-one flexibility – in addition to PACS it can be used in facilities that now or in the future will support digitization of mammography priors. If you have a file room supporting PACS and low-volume mammography applications, the 44-micron spot size and 4.0 OD DiagnosticPRO Advantage will be key in the digital transition. Single film mode: min. length of 3” (7.6 cm), max. length of 51” (129.5 cm) can be accommodated in single film mode only.